A research group at the National Institute of Standards and Technology has demonstrated a new method for detecting ignitable liquids that could change the way arson fires are investigated. The new process for analyzing debris for traces of fire accelerants is faster and more accurate than conventional methods and produces less waste. An arson investigation typically requires collecting one or two liters of ashes and debris from various locations within a fire scene in metal cans similar to those used for paint, and sending the material to a lab. 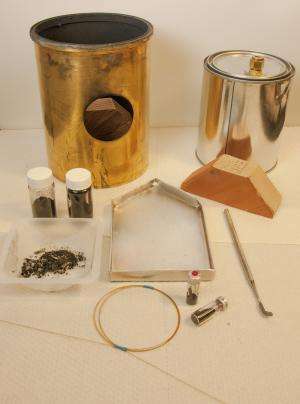 The testing methods typically include gas and liquid chromatography or various versions of spectroscopy, with gas chromatography being the most widely used in fire debris analysis, according to the lead NIST researcher, Tom Bruno. When the fire debris is received at the testing facility, samples are taken for testing. Sometimes this will involve suspending a strip with activated charcoal in the air or "headspace" directly above the sample in the paint can for a period of time that can vary, depending on the judgment of the analyst, for 2-3 hours or up to 16 hours. Other testing methods include "dynamic purge and trap" of the headspace. And still another sampling method involves a newer solid-phase microextraction method (SPME) that does not destroy the sample. This later method, however, has a high displacement rate of heavier over lighter ignitable liquid components, is difficult to automate, makes preserving and archiving samples difficult and has not shown a consistent ability to obtain repeatable and quantitative results. Also, the SPME sampling method requires expensive equipment, and the SPME fibers are easily damaged. Still other methods are less sensitive and produce large amounts of chemical waste. The vapor collection method developed by Bruno's group involves the dynamic adsorption of headspace vapors on short porous layer open tubular (PLOT) columns maintained at low temperature (as low as -40 C). The benefits of this method are many. The collection sensitivity is high; below 1 part per billion (ppb). The low temperature is achieved using a vortex tube connected to compressed air; it has no moving parts, and is attractive for use in environments with explosive or flammable materials. After vapor collection, the PLOT capillaries can be heated (up to 160 C, again with the vortex tube), releasing the vapor. The capillaries used are robust and cheap, and this process is especially effective with relatively nonvolatile substances because of its wide operating temperature range. It also is not limited to water-borne samples, as most commercial sampling instruments are. And best of all, this PLOT-cryo method can be used to simultaneously test for up to eight different ignitable liquids from a single sample. This allows investigators to take multiple samples from each of several locations in a fire scene (such as a grid approach) in a short amount of time. This method also enables high repeatability and quality assurance of the testing process and is available in a portable unit that can perform the sampling in remote locations. "This sampling method is faster, more efficient, recovers more analytics and produces much less waste than traditional methods," Bruno said. "And the sampling device and its components are much cheaper than traditional equipment." While the present study involved samples measured in the laboratory, Bruno has further developed the method to be field portable. A patent is pending for a device that will offer these same vapor collections, even at fire scenes. The self-contained portable unit is carried in a standard briefcase and may be available to arson investigators in as little as two years. More information: J.E. Nichols, M.E. Harries, T.M. Lovestead and T.J. Bruno. "Analysis of arson fire debris by low temperature dynamic headspace adsorption porous layer open tubular columns." Journal of Chromatography A. Volume 1334, 21 March 21, 2014.